Recently I had a need to be able to take an SSIS package created using SSIS for SQL Server 2014 and add the package to a preexisting SSIS 2012 solution. By default, it is not possible to take the package and add it to the existing 2012 solution as the package format is not backwards compatible. 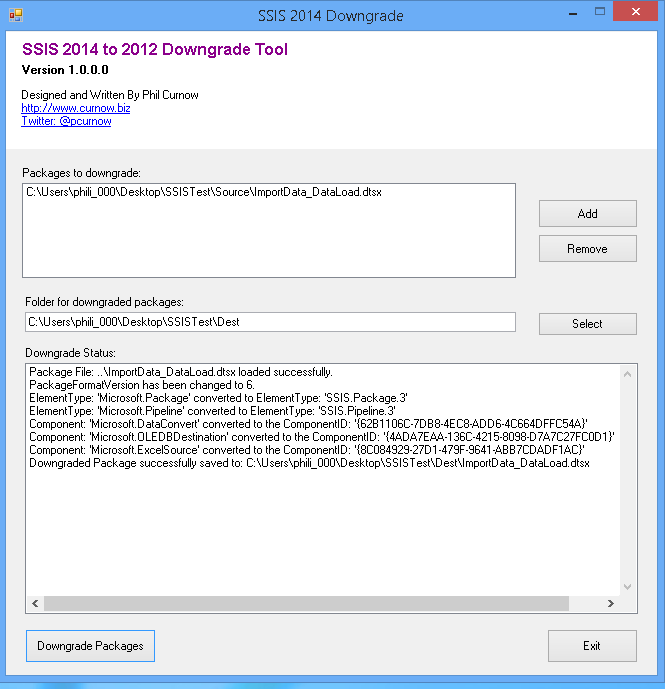 After a fairly quick Google search, I came across a blog post by Vanie Castro who explained what he manually did to an SSIS 2014 package to ‘downgrade’ it to SSIS 2012. His detailed post can be found here. Following these instructions, I was able to successfully take my 2014 package and downgrade it and add it to my SSIS 2012 solution. There was still some further adjustment to do to the package once it was in the 2012 solution, but it was certainly loadable. The manual changes were mainly around Script tasks, but this was easily fixed. If you have several packages that require downgrading, performing this manually can be a time consuming process. Using the instructions on Vanie’s blog post, I created a simple downgrade tool which enables 1 or more packages to be converted automatically. The downgrade process mainly revolves around replacing Component ID’s and Element Types. The downgrade tool is provided with two XML mapping files that contain the ComponentID and ElementType mappings. The mappings look to be fairly complete, but if any are missing, these files can be edited to add any missing mappings. If you do find any missing mappings, could you let me know and I will add them to the XML files in the package distribution. The tool has been uploaded to CodePlex where the source code to the latest version can be found. If you would rather download the an executable version without the source code, this can be found here. Full instructions on how to use the tool can be found on the Codeplex site. If you find the downgrade tool useful or have any comments or questions about it, feel free to email me or leave a comment on this post and I will reply as soon as I can.